Tanglewood in all its Summer glory. The Andrew Pincus book that explains it all. A controversial genius who once was at the BSO. Now he leads the Metropolitan Opera. 1. Don't stir up the subjects. 2. Keep the treasury full. Every Spring, the residents of our small but happy little County have courteously doffed their hats and shouted "huzzah!" as the royal orchestra and its court moved back to its Summer residence in the principality of Lenox. But after a Royal decree demanded a mandatory annual tribute from the Royal Volunteers and then took away certain privileges, there began rumblings of discontent among the normally happy peasants. "Could it be true? ', they whispered. Has the BSO, like a rich and dotty old Queen, whiskers growing from her chin, finally gone mad? The Courtiers shook their heads. One finally said: "These days I think she only hears what she wants." Finally someone worked up the courage to tell the Monarch of the rumblings of discontent. "In the homes of the loyal subjects, I regret to inform your Majesty, they are beginning to snicker." "That's not all, Madam. We have tallied up the household bills and our expenses have outpaced the takings by $1.6 million dollars. I fear we are going to have to send the Royal Beggars out again." "Then perhaps we should have them raise $400 million while they are at it, so we can repair the Royal Apartments and strengthen the fortifications." "Convene the Development Council!" she ordered firmly. Many remember it well, the High Priests were in a dither. Each Spring they would inform the public of their Summer plans and cash tributes would pour in requesting seats for the music rituals in the Royal Shed. But as early Summer arrived, the Castle Mail Chest had few such requests. Those that had arrived were from those who lived nearest the Queen's Lawn. Those whose travelled from further away were in fear of having insufficient fuel for the voyage home. The gas crisis of 1979 had struck. Thirsty coaches were lined up everywhere, waiting for the precious golden liquid. "What to do? What to do!" asked the Monarch. "Ask the Wizard," replied the Chancellor of the Exchequer. The Sorcerer appeared, thought for a moment, and said simply: "Then we shall have to fill the seats with the local people." So it came to pass that great attention was finally paid to the subjects who actually lived in the Berkshires, and neighboring precincts. Soon they filled the Shed and overflowed the grounds. The musical celebrations were saved. What manner of spells accomplished this? No magic at all, for the Wizard simply took half the money that had paid for large proclamations in the New York Times, and used it instead for more modest notices in the Berkshire Eagle, Albany Times Union, Hartford Courant, Springfield Republican and other area newspapers. The Wizard also invited the scruffy scribes of Television to bring their buskers and film crews to the grounds of the Royal Music School in order to raise knowledge of their beneficence among the public. They received a dispensation from the Royal Advisors and the Music Guild allowing them to show the Royal Tanglewood Music on television, if only for a minute or two at a time. Working with the former Berkshire Hills Conference, the Wizard helped establish a "hot line" for fueling information which was of great benefit to all the neighboring realms and fiefdoms. "If you get yourself here, we will get you home again" was the theme. But there was no need, the Berkshires only had spotty shortages. Gas was being allocated on the basis of 90% of the previous year, and the panic subsided. Despite all the lamentations of doom, the clever Wizard's simple solution enabled everyone in the Kingdom to have a good summer. 30 years ago there was a large and untapped audience in and around the Berkshires that was largely hidden and thus ignored. 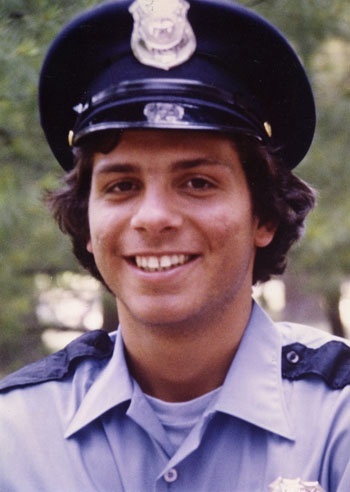 1979 represented a turning point, and to this day residents are mostly made to feel welcome and appreciated. A gaffe with the ushers earlier this year was largely smoothed over, but some of the bruised egos have not yet healed. I like to think that the Annual Berkshires Night at Tanglewood commemorates the ongoing, if sometimes bumpy, transformation. Much of the credit has to go to one writer. During this long period, Andrew Pincus has written extensively in the Berkshire Eagle about Tanglewood and the Boston Symphony. He has been a defender of the volunteers. But now much of his hard work has been set back by a poorly thought out editorial in the Eagle which discussed the BSO's resistance to allowing more pop music to be presented, arguing that such a move would help meet the expenses while expanding its reach. It is clear that Pincus could not have possibly written this piece, and that it was likely authored by a novice editorialist who also happens to be a disgruntled pop music fan. The full text is here, for a while at least, since the Berkshire Eagle does not archive its work for very long. Nevertheless, the editorial raises important questions, though not all the ones that need to be asked. "The ushers are service people, not security," said the editorial, complaining that an usher had dared to ask children not to run around during a quiet passage. Children don't run silently, as you know, so they more likely running and either laughing or yelling or screaming. But the editorial would have us tolerate the parents who were oblivious to the distraction and let their selfishness disrupt the enjoyment of others who had paid for music, not distractions. Well, catch this clue. The BSO has special performances designed for families with children. If parents want to bring their run-arounds to other performances, the young ones are expected to act like adults. It is only fair to the other concert goers. The editorial was correct to point out that ushers are not security. They are more the keepers of the flame. They are most certainly not "service people", but generous volunteers, our neighbors. The comment piles onto the BSO's own volunteer insult this past Spring when they were ordered to join the "Friends" and contribute a minimum of $75 in addition to donating their time, taking away many of their ticket privileges, and treating them like serfs in the process. It is clear that this editorial writer, in addition to being unable to spell ("The sun shown on Tanglewood...") was not the least bit familiar with classical music traditions in this country, or they would have known - that other than a policeman or two in case of a heart attack or heat stroke - orchestras don't need much "security". That is for the rock and sports worlds, where mob behavior sometimes becomes a problem. There is a middle ground that should be acknowledged for events like James Taylor's concert on August 24 and the recent Jazz Festival performances where some overzealous ushers tried to hold down the crowd's exuberance and enthusiasm. During a symphony, the audience does not break into applause over a clever variation. In jazz, however, it is customary for listeners to acknowledge a great riff with just such spontaneous applause. It is simply a matter of understanding your audience and going with the flow. This is not to suggest that all practices are equal. The final insult of the Eagle's editorial was the blithe acceptance of all the despicable demands of pop music promoters: "Rock and rollers," the editorialist pronounced, "would not be put off by large Budweiser signs, parking fees, or a ban on outside food needed to sell pricey hot dogs and beer to deep pocketed baby boomers." Really? Unbelievable. That said, there is the matter of the fist fight that broke out at a Symphony Hall Pops concert not too long ago. Someone in the balcony was chatting away during the performance, and got the glare and shhh... treatment. It escalated. The police were brought in. Peace was restored. The BSO always has a policeman or two on hand, but they are shocked when they actually have to do something. Concert audiences are usually quite well behaved. At Tanglewood, I expect the police are more essential to parking and traffic problems than crowd control. 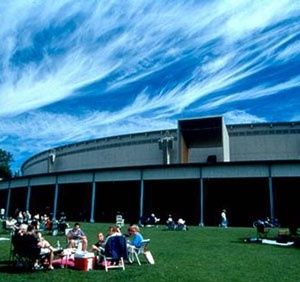 Writing about Music director James Levine, Andrew Pincus noted that the Tanglewood audiences are changing. "They are more attentive now, with less talking and other distractions than in the past. There is still intrusive applause between movements from the back sections, but this can be a good sign...not all such applause is misplaced, incidentally." If one wishes boisterous behavior with their music, one goes to the San Carlo in Naples for Opera where singers are hissed and cheered by rival claques of contentious fans. It's more fun than a mosh pit and safer than some rap concerts! 1979 was the Summer Arthur Fiedler died and I spent a lot of time in the Press Cabin at Tanglewood where I was forced to listen to performances through a terrible, tiny, tinny 4" speaker hanging out of the wall from two spliced wires. It was the classical equivalent of water boarding. It scarred me for life. My partner-in-crime was Peter Gelb who was fuming because they wouldn't give him the title of a BSO Assistant Manager. He was simply called the Promotion Manager. It was just his neurotic ego at work, but I sympathized. Both of us moved on shortly after that, and he has risen through the business to its pinnacle. 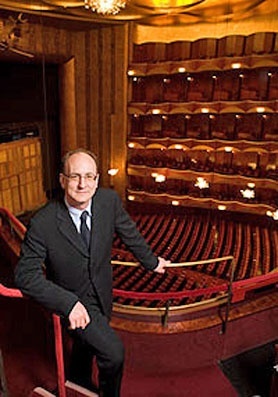 Last year he was appointed the 16th General Manager of the Metropolitan Opera. He is a genius at promotion and I learned a lot from him. I even had the honor of cleaning up a couple of his messes. One thing about Peter, wherever he goes, it is an advanture, though controversy stalks his every innovation. In an interim job, as head of the Sony Classical record label, Gelb, now 53, attracted criticism for favoring crossover fare such as James Horner's Titanic soundtrack and Charlotte Church. If Gelb were manager of the BSO today, there is no question in my mind that he would have created daring off-season programming at Tanglewood which would be giving the traditionalists apoplexy, unless the Trustees had somehow managed to break and saddle him. Andy Pincus was in his first or second year of covering Tanglewood for the Eagle. Professional, friendly and smart, I actually looked forward to chatting briefly with him each week. He was nice. Berkshires nice. Pincus really cared about Tanglewood. He loved the tidbits I fed him. And he didn't bite. 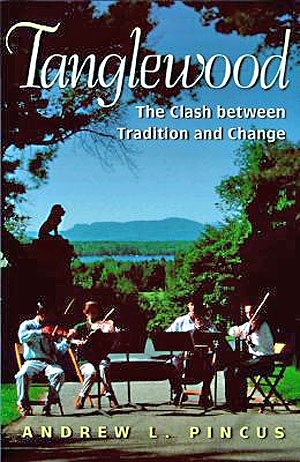 Two decades later, his Book, "Tanglewood: The Clash Between Tradition and Change" was released, and while some rival critics like Richard Dyer dished it, I found it a superb explanation of what was going on with orchestras all across the country. 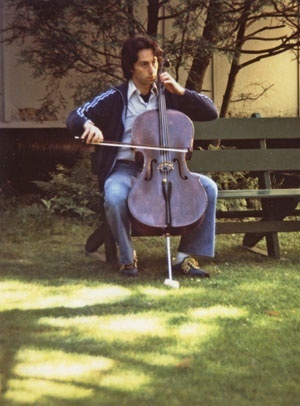 Dyer also praised him, reminding us that "Over the last 25 years, Pincus has certainly spent more hours on the Tanglewood grounds than any other journalist and probably more than any musician or administrator." Despite this, the BSO briefly considered banning the book's sale in its gift shop, but relented. Today it may be somewhat dated, and can be had Amazon for a dollar or two, but it remains an important chronicle of Tanglewood's history. Sometimes I wonder if the managers at the BSO and at the Berkshire Eagle have forgotten his credentials. He has been a contributor to the New York Times, Boston Globe, Opera News, Musical America, and numerous other publications. He has twice won the ASCAP-Deems Taylor Award for excellence in music criticism. If you used Harvard Business School case study techniques you would examine the BSO patron from a "customer lifetime value" standpoint. The need for money is unrelenting. Oh, the public helps foot the bill with all those ticket sales, but that only covers part of the expense as everyone knows. Finding new donors is not easy, but once aquired, they tend to stay around forever. That's a primary reason change comes so slowly. Even so, the Music Directors do their best to keep the programs a few notches above the Trustee's typical comfort level. The musicians work hard to schedule new or rarely performed works that deserve attention, and the process is daunting. They have to convince management, trustees and ultimately the press and public. Everyone has an opinion. The Boston Symphony's secret world of financial politics is hidden behind closed doors. It is the key to understanding its ossified nature and the roots of the current controversies. Every other art form has a pretty direct route from creative impulse to public performance. But at the BSO, creativity and change are filtered through a challenging series of steps, and even when a consensus is reached, there is the matter of who is going to open their checkbook. Many a good idea has died for lack of a willing backer. Other ideas have died despite being generously supported, because they did not measure up. Things have changed little in the past century. The once frowned upon "new money" has lost much of its former stigma. But it is the old money that counts the most, as it always has. The folks from Beverly Farms and Magnolia, Beacon Hill and Brookline, Lenox and Stockbridge, whose family names have appeared in the program credits for years are the ones that speak the loudest. One doesn't alienate the old families whose bequests have built the orchestra and its nearly half billion dollar endowment. Old money resists change - though there are exceptions - things like lower tax rates and abolishing the Estate Tax. Other than that, tradition prevails. Reading the continual flow of music reviews, one only finds small eddies of change. Larger change comes with each new music directors. Leinsdorf represented the German aristocracy, Munch the French. Then things moved from being Euro-centric to the Ozawa Shogun period. And now, what shall we call it. The House of Levine? Astonishing. Traditions die hard. The BSO still performed Beethoven's 9th to close each season until last year when Levine chose it as the opener. This year Levine had the student orchestra undertake it, so it went under the baton of Rafael Fruhbeck de Burgos. There is talk of abandoning it altogether next year, but I won't believe it until the Beethoven inscription on the proscenium at Symphony Hall is replaced with Mozart or Mahler. Audience development is what professionals call selling tickets, but it takes a lot more than printing tickets and announcing a schedule to get all of them sold. It takes creativity. It is a field I know well, and in the case of the BSO, worry about. Once again, transport yourself back a few decades because this parable is still relevant today. At a meeting with Steven Mindich, publisher of the Boston Phoenix and the owner of several radio stations, we got pretty heavy into the subject of music audiences. I had known Steve since his BU days, and could always count on him and Barry Morris for a lively discussion. In the end, we came up with a complex Boston Phoenix/Boston Symphony promotion package for the Symphony's Annual Musical Marathon. It would cost Steve plenty, give the BSO access to his media empire and its tens of thousands of readers and listeners. In return, the Phoenix would be able to put its name on a number of BSO catalogs, ads and promotional materials they would print for free. There was a lot of marketing savvy behind it. We both knew that many young people lived in many musical worlds, attending a classical concert one day, dancing at a rock club the next. We wanted to harness this flexibility, and make it a "thing" that defined a rich and fulfilling life without sounding preachy. The problem is not that some people like classical and others love jazz, but that the public is divided into those who go out a lot, and those who stay at home. Someone in the bleachers at Fenway Park is more likely to buy a ticket to a live performance than someone who sits at home watching television. Research has shown that college students away from home and young professionals who are not yet married are very adventurous, and go out a lot. They are willing to try new things and learn. With the passage of time, they become parents and the raising of children takes over. "Going out" becomes a special occasion event, just as the tastes of the mother and father tend to calcify, and rarely change after that. When the children leave the nest, the freed parents begin to go out again, but to the kinds of events they enjoyed in their youth. If they liked classical music, this is where the most loyal subscribers come from. If they never went to Symphony, it is unlikely they ever will. You have to get them when they are young. The Phoenix reaches young people at the time they are most willing to try something new, and this co-promotion was seen as just what the BSO needed. We talked about ways to do crossover events as part of the Marathon, to find ways to link the two audiences. After considerable planning and haggling, We thought we had a revolutionary and noble experiment set to go. Of course this generous offer was relayed to the BSO management, who insisted that it be approved by the volunteer committee that ran the event. When the group met, Judy Gardner, its chair, pursed her lips and said: "But isn't that the newspaper with those personal ads?" "Oh, we couldn't do that," she said. Peter Gelb, Tom Morris (the BSO manager at the time) and the assistant managers avoided looking at me and remained silent. It was clear at last who was really running the BSO. The professionals didn't make the decisions, the monied people did. Afterwards, the esteemed Mrs. Gardner came over to me, took my hand and patted it. "Dear boy, after you have been here for another ten years, you can make suggestions...."
The idea of more popular music at Tanglewood is intriguing. Everyone wants to offer suggestions and the ideas have been flowing. But if you want to think outside the box, draw a circle around it, then go beyond the box but stay within the circle of real possibility. So it is clear that guitar-smashing headbangers and punk groups need not apply. That's not to say that playing it safe is the only course. A number of concepts will have to be tested before a compatible and financially rewarding "shoulder season" is fully defined and embraced. To their credit, the BSO managers have made superlative choices to date. James Taylor's concert in the Shed on August 24 was the season's biggest, drawing 18,211 people. The just completed Freddy Taylor Jazz series was also was a big success, considering it was presented in the smaller Ozawa Hall. Charles Giuliano reports that the final attendance number was 13,202 for the Tanglewood Jazz Festival. "This was for five concerts over three days. Ozawa Hall holds about 1,000, so that's at least 8,000 in lawn tickets. Overall, strong numbers. Inside top tickets were $57 and admission to the lawn $17." "So how much revenue was generated?" Plenty. As he noted, "Overall it's a win win for the "shoulder" season." When dollar bills flutter down on the box office, even more trickles down for restaurants, gas stations, etc. and everyone in the Berkshires gets happily wet. Both events pleased the public and left the grounds in good shape. The gentle Prairie Home Companion is also a great fit, especially considering the rural nature of the Berkshires. BSO manager Mark Volpe has floated the idea of bluegrass and folk music concerts in the Spring and Fall also to be held in the smaller Ozawa Hall. Let's hope he pursues this as there is an audience in the Berkshires for this. Mass MoCA presented the great Ralph Stanley and His Clinch Mountain Boys on July 7 at MoCA's Hunter Center. Do I dare mention Andre Rieu and his fluffy, cotton-candy schmaltz music? His tickets sell though his appearances seem to be evolving into dreadful arena events. For many of us, there is nothing worse than sitting in a cavernous stadium listening to badly amplified classical music. Still, it would be worth exploring. Tanglewood and Rieu could be a marriage made in Candyland, with a television special and DVD its natural outcome. But diabetics, take note: bring plenty of extra insulin. The PBS connection brings to mind such offerings as Sarah Brightman, Elvis Costello (who appeared at Tanglewood in 2006), and some of the artists who perform on Austin City Limits. Turns out some of them are managed by the same Columbia Artists (CAMI) which also represents the BSO and the Pops. Booking is the easy part. Finding the right creative hook and artistic raison d'etre is more difficult. In any case, there is no reason to buy into the argument that you have to accept garish beer billboards to be set up, allow the aroma of hot dogs to waft over the audience, or even charge for parking. 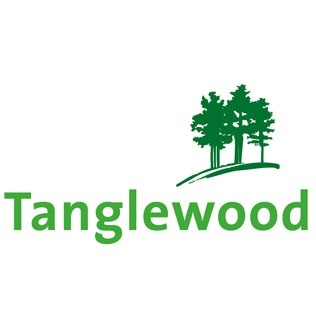 Tanglewood is about music, not greed. I remember sitting behind the Miller Beer promoters when Bette Midler appeared at the Concerts on the Common series in Boston in the late 80's. They were grumbling about how small the simple sign was that acknowledged their sponsorship. They were unhappy their big electric one was not allowed on the Boston Common. I tapped them on the shoulder and pointed out that while small, it would leave an indelible impression on everyone there because it replaced bad taste with good. It read: "It's Midler Time". I've remembered that simple sign all these years. What was the last flashing billboard you can remember with fond memories? Boards set policy, managers negotiate contracts, artists set programs, and sponsors decide if they want to be part of the package. You don't let a horse lead you to where it wants to go, you have to hold on to the reins. Another innovative group with a large Euro following is the Penguin Cafe Orchestra. They are a cross between Mass MoCA's "Bang on a Drum" and chamber music. Quartetto Gelato is like an evening in an Neopolitan Cafe or the main square in Venice. Truly eccentric and outrageous, it is dedicated to the memory of the legendary Thomas D. Perry, Jr., the most buttoned down BSO manager ever. The story goes that when the BSO purchased a sensible new black sedan in which to transport the guest soloists back and forth, Perry was aghast at all the chrome. This was the 1950's after all. He immediately had it sent back to the dealership to have the garish decorations removed. I can only imagine his gasps viewing this video from "Vitas", a Russian pop crossover artist singing the great aria from Lucia. Counter-tenors, anyone? Will there be a happy ending to this tangled tale? Time will tell.